If you are the type of person that always comes back from holiday with more than you left with, then these travel bags might just be for you. The temptation to buy things on trips is always there, maybe you want to grab some cheaper clothes or you want souvenirs and gifts for the family back home. Whatever the reason, these bags are ideal for carrying all that extra stuff. Because they are light and can be folded up, you can take them in your luggage and fill them up when you are there. This list has the top three travel bags on the market at the moment, let’s take a look at them in more detail. This travel bag from Skypak is a very handy thing to take with you on trips. It can accommodate a large amount of things, but fold up very small. Here are some of its other features. The capacity of this bag is quite impressive considering its size. It measures 40cm high, 75cm long and 30cm wide. This gives it a total volume of 90 litres when full. It means you have an additional capacity available if you need it. It is made from a durable nylon material that is sewn together securely. You won’t have to worry about tearing or stretching. It also has strong plastic zippers that are hard wearing. There are two carrying handles as well as a shoulder strap for ease of use. It will fit comfortably on the shoulder without slipping. Ideal if you want to keep your hands free for other bags or your phone. Because this bag is so light when empty, it won’t add much to the weight of your luggage if you want to take it away on your trip. The only problem is the temptation to fill it with holiday goodies. The Skypak 90L Folding Travel Bag is ideal for those holiday shoppers who can’t resist a bargain while they are away. It folds down to a very small size but it can add another 90 litres of capacity to your luggage on your return. When it comes to lightweight yet high capacity travel bags, this example is one that you should consider. 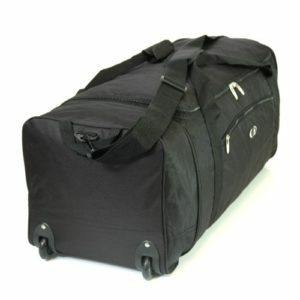 The Large Travel Cargo Weekend Bag does exactly what it says, it can cope with all your travel, sports or weekend belongings with no problem. Here are some of its features. The bag itself can be folded up into a small handbag size. Ideal for putting into your suitcase or in the boot of your car. You can take it on holiday with you if you need to bring things back with you, or it can be used as an overnight bag for short beaks. The dimensions when full are 34cm high, 74cm long and 37cm wide. This is a total volume size of 100 litres. You can fit a lot of things into this bag to add to your capacity on holiday. As well as the main compartment, there are also side pockets that you can use to put things you might need quickly. It also makes for easier unpacking at the other end of your trip. It is fitted with two carrying handles and a detachable shoulder strap. This gives you the flexibility to carry the bag however you wish. The shoulder strap is comfortable to wear and leaves your hands free. The tough polyester material will protect the contents during transit. But it is also very lightweight so it won’t add too much to your luggage allowance during your travels. This Large Travel Cargo Sports Weekend Bag is a versatile product that will suit the casual traveller, or someone who needs additional capacity. The well-made design and hard wearing material will last for a long time. This travel bag has many of the features you might be looking for if you were considering buying one. But it also has one or two other features that might make this a product worth considering. Let us take a look at some of those features. 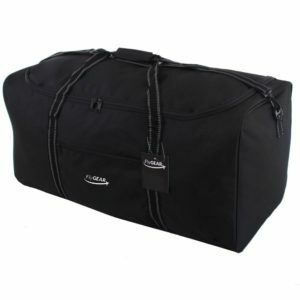 This bag can be unfolded and used for extra storage or as short break luggage. The dimensions are 79cm wide, 33cm high and 33cm deep. This gives it an overall capacity of 87 litres. More than enough space to take a change of clothes or to carry additional items on your return journey. It is made from a hard wearing and lightweight polyester material that won’t take up much space in your luggage when folded. It will also protect your belongings when being used. It is seen together using strong stitching to prevent tearing or stretching. The large double zipped compartment can hold big items or clothing and there is also a zip pocket and zip net for other smaller items. You can then access these quickly if needed. This bag is fitted with wheels to make transporting it even easier. They are made from a strong plastic that won’t break when moving over rough surfaces. The two carrying straps and detachable shoulder strap mean this bag can be carried in a number of ways depending on what is best for you. 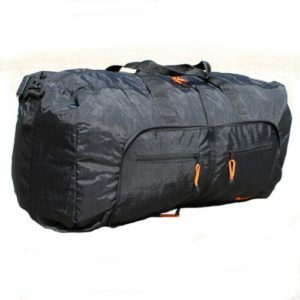 The Large 32 inch Folding Wheeled Travel Duffel Bag is a useful product can add much needed storage without taking up a lot of room. The wheels add another dimension that many other travel bags lack. Overall, this bag deserves a place on this list. The top spot on the list goes to the Skypak 90L Folding Travel Bag. It is a versatile bag that can carry much needed additional storage when you spot those holiday discounts. It can be used for many purposes such as sports activities, overnight stays or business trips and folds down into a nice compact size that can go in the boot or suitcase. Overall, this bag is a worthy winner of the top spot on the list.